Home » Splish Splashing in the Manitou Rain! We all woke up to the pitter patter of rain this morning, and to the first real rain day of this Manitou summer! But the rainy weather never gets us down at camp…we have a blast no matter what the weather is! All of our campers and staff arrived to breakfast in their brightly coloured raincoats, and soon it was a normal camp meal. Songs were playing, kids were dancing, and cabins were cheering…which is the classic Manitou way! 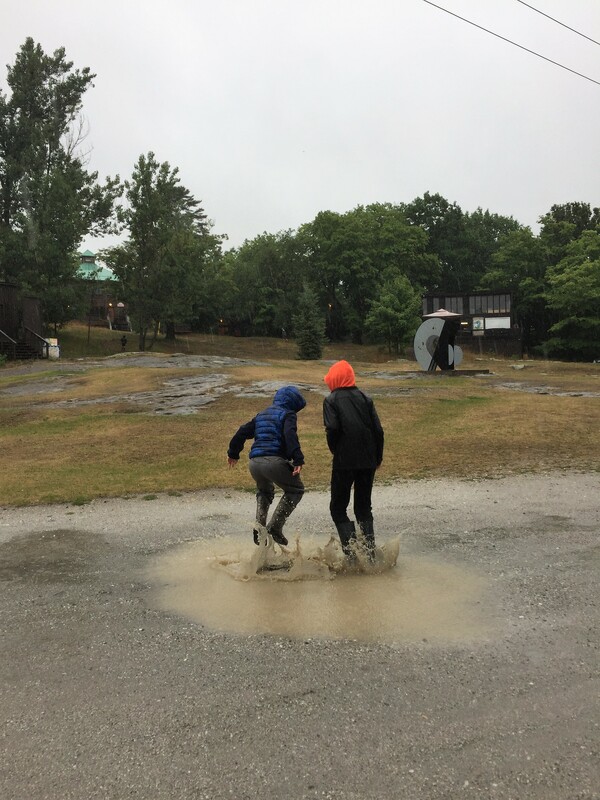 Even right now, activities are running and campers are having a blast as usual…just look at those two splashing around in the rain! And I am positive we will see a mudslide or two at some point today…such fun! We also have a new edition of our Manitou newspaper The Mosquito coming out today! All of our Mosquito reporters, illustrators, and writers have been hard at work making the paper, and they’re excited to finally share it with the camp. Because all of you lovely readers aren’t able to get a copy on your lunch table like us, I have attached it HERE for everyone to enjoy!